Blog WordPress Optimization and Tutorials Why Blogger Should Stop using Tags in their WordPress Blog Post? WordPress Tag is a predefined taxonomy since beginning. Almost all, I would say 99% of the sites use WordPress Tags in their blog post. 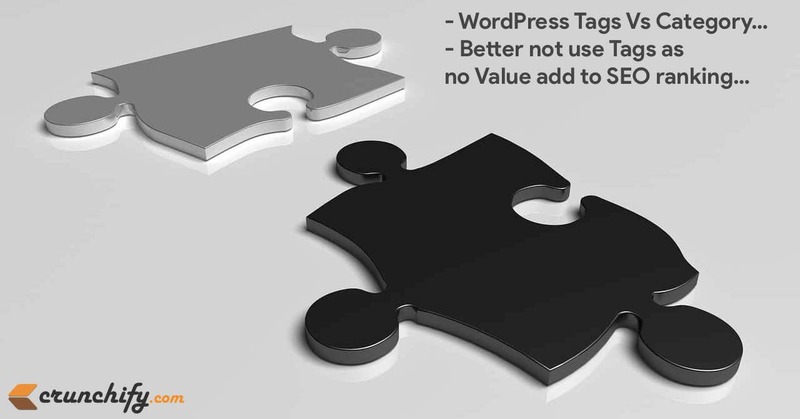 In contrast to WordPress Category, Tag holds low value and works as Keyword for your blog post. On Crunchify, starting 2012, we have been using Tags extensively. As you know, Google algorithm changes everyday and long time back Google mentioned about no value add to Keywords. Here is an article by Matt Cutts. Over the years on Crunchify we had created lots of Mata Tags. Take a look at below my post meta. So why this change now? Well, I was spending some time figuring out what all meta tags I should use in blog post and wasting valuable time which wasn’t even required as per Google Search Engine guidelines. So we have decided to remove all Meta Tags from site and infact we have deleted those from Tags page. 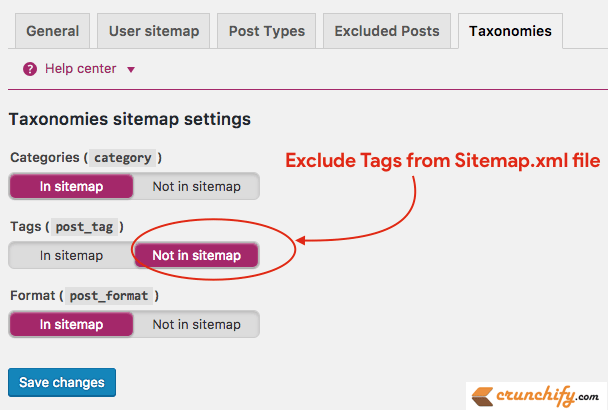 You might be thinking now – then why WordPress has default taxonomy called Tags? Well, it’s for users who want to distinguish their articles by special key words. This can be achieved by also with ONLY Categories taxonomy. What all steps I’ve performed to get rid-off Tags on Crunchify? Removed all Tags as you saw above. Use Better Search Replace plugin and replace string with all /tag/ with /category/. If you still want to keep some important Tags then I would suggest to convert Tags to Categories. Add .htaccess redirect for all links with tag inside to home page as some of your tags might be indexed in Google Search Engine and you may not want to give 404 result page for those tags. This is what I’m using at my end. Please modify your domain name. Go to Google Search Console and resubmit your sitemap.xml file as this time you won’t have list of tags in sitemap.xml file. The reasoning for not using tags here is that they don’t add any SEO value, and that Yoast fills your front end code with meta keywords. But categories and tags were not created as tools to improve SEO, they were created to make your blog easier to browse and are not really interchangeable. Or if they are, you’ve probably been using them wrong. So, the recommendations for using tags and categories have always been to think of categories as chapters of a book, and tags as subjects that might appear in one or several chapters. Or lets pretend we’re writing a blog on vehicles. I’d use categories such as Airplanes, Trucks, Vans, Cars, Motorcycles and Bicycles. These are big groupings of forms of transportation. But I’d use tags for vehicle brands such as BMW, Mercedes, Peugeot, SAAB. BMW would exist in both cars and motorcycles, Peugeot would exist in both Cars and Bicycles. Mercedes would exist in Trucks, Vans and Cars, SAAB would exist as both cars and airplanes and so on. So my question is this, is the problem that the tags are added to front end as meta keywords or are there any other problems with tags? Hi Carl – thanks for detailed insight. I do agree in some categories of blog – tags are essential to distinguish different products, books, videos, etc. As per my over past 10 years of consulting experience – blogger/author spends almost ~half an hour to find different meta tags to their post. Then they keep adding meta keywords in their post’s head section thinking Google will rank their post higher just because of tags they have placed in head of the page. This complete thinking and process is like waste of time. So, in order to avoid this finally I’ve decided to publish this post and to avoid confusion – better don’t use tags and achieve goal by Category.